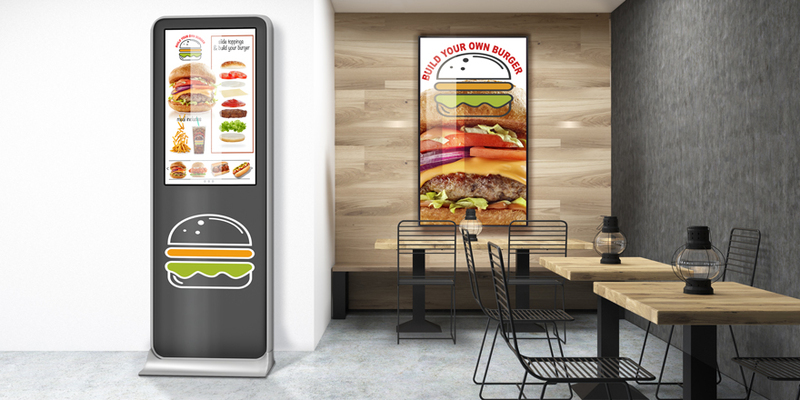 In recent years quick-service restaurants have become major users of digital menu boards and other displays, and their number continues to grow due to the proven advantages digital signage offers over printed (static) menus and cardboard signs. QSR franchisees are converting their old restaurant and refreshing its look to keep in line with the corporate brand image. As they remodel they are incorporating digital signage to: 1) Keep up with screen-savvy younger generations that have come to expect a digital experience. 2) Realize the efficiency of automatic menu dayparting and real-time content control. 3) Deliver promotional messaging to customers waiting in line, whether it’s about a new menu item, store event or limited time offer (LTO). Digital signage applications for QSR include menu boards, drive-thru displays, promotional displays, self-order kiosks and infotainment displays. Digital signage can enhance the overall restaurant design, reinforce the brand identity, improve efficiencies and ensure content consistency in multi-site operations. It imparts a clean, modern look and offers numerous opportunities to display a wide range of information in engaging new ways. Simultaneously, it can help cultivate customer loyalty and a desire to come back soon.